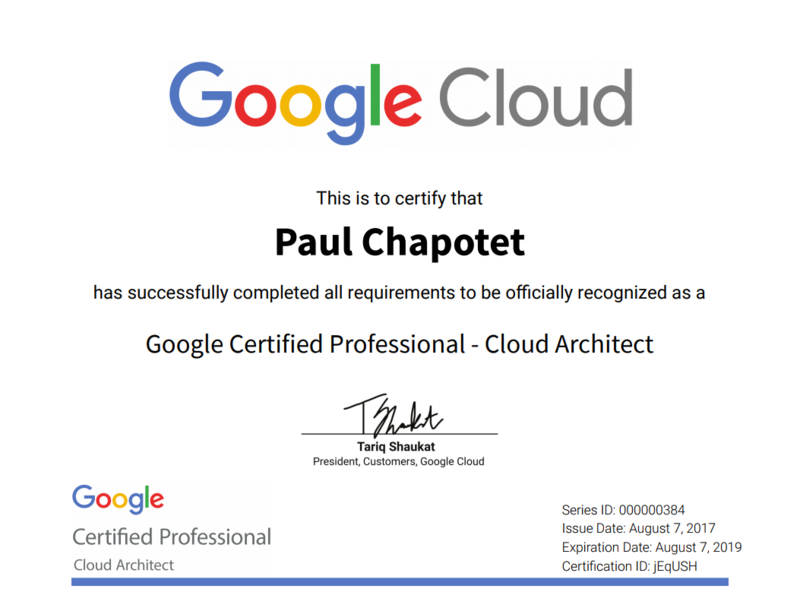 Google Cloud Architect Professional certified! Taking the GCP Architect exam is quite a challenge as there is very little study material or practice questions available at the moment. To sum up the exam without saying too much, it was 50 questions for a total of 120 minutes. Timing is friendly, I had about 15-20 minutes left before the end. Half of the exam worked pretty easily by proceeding by elimination to remove the craziest answers. I was surprise to see a split screen with questions on the left and a listbox on the right allowing to switch between the 4 use cases available at the moment. About 15 questions were related to use cases. They seemed more complex, even confusing sometimes. I had to use only 2 use cases out of 4, the rest of the questions is more general and seemed to be what I would categorize as medium level questions. Once again, good luck to everyone taking this exam! AWS DevOps Professional Certification – All-5 AWS certified! Do we need to memories case studies given in GCP exam course or they will provide access to them ? Hi Sukrat, they will be provided during the exam (on half of your screen). Do they ask you to code? Or just to study code and answer multiple questions about it? Thanks! Hi Nadine, it’s only multiple answer questions. But sometimes they show you a piece of code in the question. How long did it take to prepare for the GCP Architect Exam ? Hi Anand, is the course still available? I’m not able to purchase it. Anand’s exam is no more available in udemy. Where else we can find? Thank you Victor! My feeling is that the GCP CA certification is more difficult than AWS Associate exams but not as difficult as Pro exams. Good luck on the all-5, not an easy task! How much time gcp result comes ? Official confirmation and certificate come after a few days, but you get your PASS or FAIL directly at the end of the exam. The result displayed after submitting the exam will be the final result? I did not understand why we have to wait for an official confirmation when they are displaying a result after the submission. How many did you have to answer right to get the pass on the GCP -Architect. And How long did you study. Hi Sunny, unfortunately they don’t tell you anything about your score when you pass the exam. I haven’t seen a minimum percentage neither. I studied 3-4 weeks (4h/week) before the exam. In term of experience 5-6 months passed between my first day on GCP and exam day.